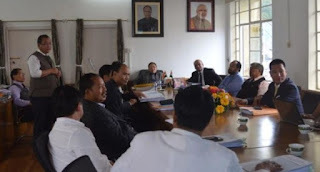 Kohima, Sep 23 : Nagaland state Chief Minister, TR Zeliang on Monday reiterated his opposition to the auctioning of oil blocks in Nagaland by the Government of India. A press statement from the CMO said that the centre’s action on this would have an adverse effect on the Naga peace process and requested the Government of India to reconsider its decision to auction oil blocks which are located in Nagaland. Recent reports had cited the Government of India’s decision to put up for competitive bidding the 69 marginal oil fields which have been held by ONGC and OIL, but which have not been exploited. The Chief Minister along with Parliamentary Secretary for Geology and Mining Dr Imtiwapang Aier had camped in New Delhi for a week seeking an appointment with the Union Minister for Petroleum and Natural Gas. However, the CMO informed that they had to return to Nagaland last Saturday since the Union Minister was said to be busy with elections in Bihar.